In only its second year, the Young Engineers Shape the World program is exposing high school students in the Phoenix metro area to opportunities available in engineering in an effort to help bolster diversity in the industry and increase the representation of women in engineering. Young Engineers Shape the World left its pilot phase on Sept. 15 with a kickoff conference for high school students and their parents on ASU’s Tempe campus. The free program, organized by the Ira A. Fulton Schools of Engineering, targets underrepresented groups in the engineering industry, like women, first-generation college students and students who demonstrate financial need. After a morning of seminars providing information about the program and financial aid and college-readiness provided by Access ASU, the high school students broke into groups for a design challenge to encourage teamwork and problem solving. With nothing but a ruler, deck of playing cards and tape, the teams were commissioned by a fictional stakeholder, Seeking Peace And Rejuvenation Kayaking Society (SPARKS), to design a lake-viewing platform. After 55 minutes of designing and building, the teams presented their structures. Each group’s platform was different — some built from rolled-up playing cards, while others assembled a more traditional card tower. Fictitious stakeholders, played by current engineering students or recent alumni, gave the high school students feedback on their designs, but the main takeaway was: Engineers ask questions, and students should too. 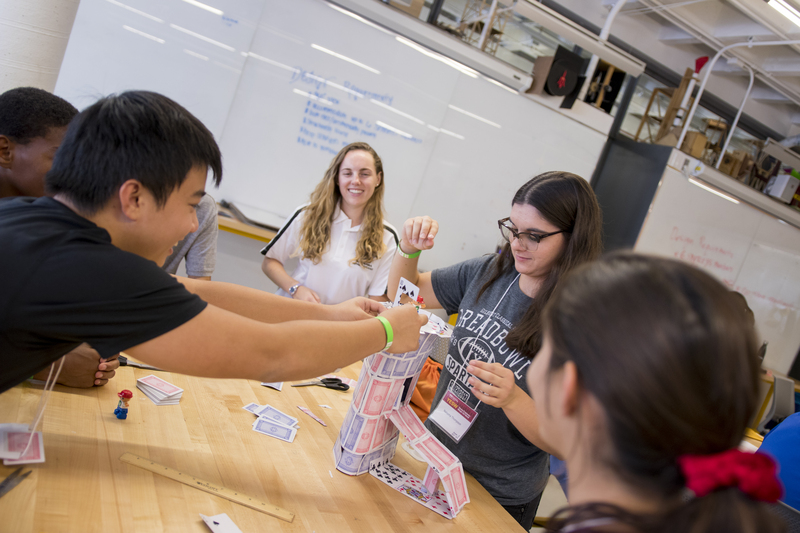 Throughout the semester, the Young Engineers Shape the World high schoolers will attend three-hour Saturday workshops to let them explore different specializations of engineering through hands-on learning experiences like the ones at the kickoff conference. Additional events like the Evening with Engineers Industry Nights allow students to ask questions and network with industry professionals. The workshops are held at ASU's Tempe, Downtown Phoenix and Polytechnic campuses, and at the Tolleson Union High School District Office in the West Valley. The high schoolers participating in the program come from all over; one student drove two and a half hours to attend the kickoff conference. During the program’s first year, 98 students participated in at least one Young Engineers Shape the World event. This year, 174 applicants have been accepted, and the program team is looking forward to accepting more students next year. Increased registration is pushing the program to grow to potentially larger classrooms and additional weekend sessions. One of the Thielen’s teammates, Aditya Mehta, said he would definitely come back for more Young Engineers Shape the World workshops. Even after just one year of the program, participants such as Loren Kueker have gone on to study engineering at ASU. Kueker was already attracted to the problem-solving and building aspects of engineering, but found the collaboration at the Young Engineers Shape the World events made a difference in understanding how engineering works. In the pilot phase, Young Engineers Shape the World set the program up at schools throughout the Valley and on the Tempe campus. When Kueker was in high school, one of her teachers introduced the program to Verrado High School. Over the next year, Kueker continued attending workshops at her high school. Now a freshman at ASU, Kueker studies chemical engineering within the School for Engineering of Matter, Transport and Energy. She is interested in getting involved in Young Engineers Shape the World again in the future, but this time as a mentor.